Today I spent some time in the Lincolnshire town of Louth. I hadn't realised but this is the home of Pocklington's Bakery. On a previous trip in 2014 we found that their pies are widely available around Lincolnshire. After giving their Steak pie a comprehensive review we found it worthy of recommendation. 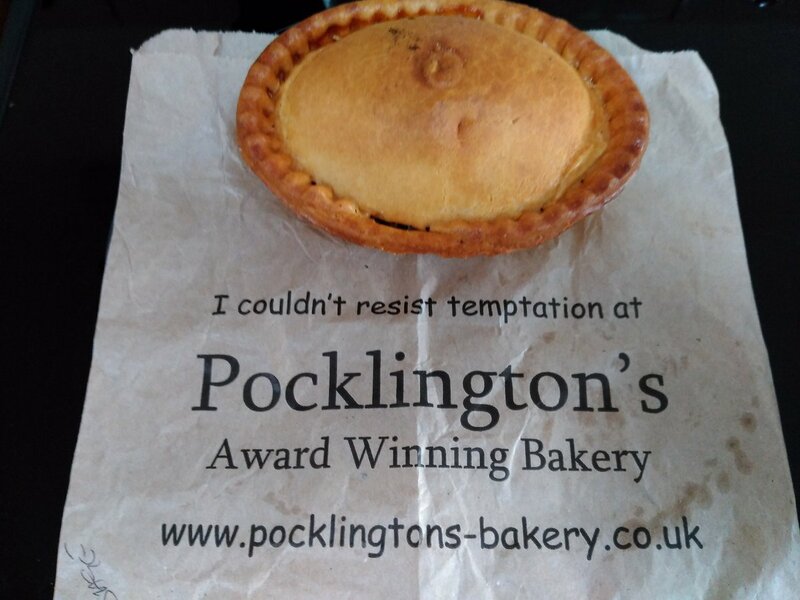 When I just happened to come across their Bakery I felt I had to get another pie to review, as their slogan says "I couldn't resist the temptation at Pocklington's". At £1.60 for one or two for £2.00 I had to get two as it seemed to much better value! I picked up the Steak and also the intriguing Sausage & Onion. So how did the pies compare to last time? The pastry was crisp on the outside but a little bit like bread on the inside. It tasted okay but I was tempted not to bother eating the thicker pastry around the crimped edge. It was good to find that the Steak pie was of a similar standard to before with decent chunks of meat. The Sausage & Onion was as interesting as it's name suggests. The sausage meat sat in the bottom of the pie in one lump, akin to a pork pie. 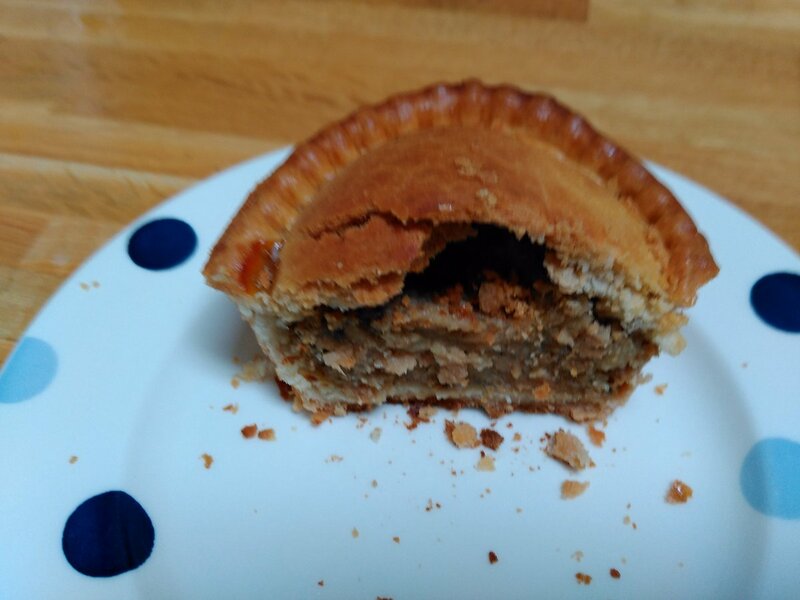 It was actually similar to an Onion Marmalade Pork Pie I have previously reviewed. The Onion seemed to be caramelised which gave it a sweet flavour. Sadly, it was a bit too sweet for me and I didn't enjoy it very much. I have tried to not hold this against it too much in the score as I think other might like the sweet taste. It was a bit lacking in filling though, being perhaps just over half full which meant I had left over pastry at the end. I think this would have worked better as a smaller, pork pie style pie. On the plus side the meat was moist despite the lack of any gravy and it slipped down well. Overall, I think next time I would just get two of the Steak pies! P.S. Just remembered I have had a Sausage & Onion pie before from Cornwall's Pride! I have eaten so many pies now I can't remember them all!